The success of Super Mario Bros. had transformed the fortunes of the Famicom and become a cultural phenomenon. At the time All Night Nippon was the most popular radio station in Japan and had begun airing programming related to the Famicom. In 1986, Nintendo and NBS struck a unique deal to create a piece of promotional software for the All Night Nippon station that would be given away in a prize draw. All Night Nippon Super Mario Bros. is a remix of Super Mario Bros. with graphics, stages and gameplay elements from The Lost Levels. Sprites in the game were replaced with radio hosts and other icons related to the station. Princess Peach has become the ruler of the Viva Kingdom, but Bowser is up to his old tricks. He kidnaps a group of celebrities from the All Night Nippon radio station and locks them away in his castles. He convinces Nakano Sunplaza to join him by sending him a letter praising his "eye for business". The Viva Kingdom is named after "Viva Young", a show that was running on All Night Nippon in 1986. Nakano Sunplaza famously arranged for large groups of people to descend on small businesses in areas subject to economic difficulty. These stunts became known as his "eye for business". The majority of All Night Nippon Super Mario Bros. plays the same as the original Super Mario Bros. running in the Japanese Super Mario Bros. 2 engine. Graphics for the background, ground tiles, Mushrooms and some other items have been updated to their The Lost Levels designs. You choose a Mario Game or Luigi Game at the start. Luigi can jump higher but has less traction than Mario. There is no 2-Player mode. It is possible to get a high jump when stomping on the back of a flying enemy if you time your button press. This was introduced in The Lost Levels and has become a staple move in later Mario games. Cheep Cheeps move on more obvious diagonal paths in the underwater stages. World 5-3 has been replaced with World 4-3 from SMB:TLL. World 5-4 has been replaced with World 2-4 from SMB:TLL. World 6-4 has been replaced with World 4-4 from SMB:TLL. World 7-2 has been replaced with World 6-2 from SMB:TLL. World 7-3 has been replaced with World 6-3 from SMB:TLL. World 8-4 has been replaced with World 8-4 from SMB:TLL. This is the only replaced stage that wasn't a repeat stage in SMB. Clearing World 8-4 without using a Warp Zone will take you to World 9. Additionally, each time you clear the game a Star is added to the title screen. Once you have at least 8 Stars, hold A and press START to play through Worlds A to D.
Fireworks no longer go off when you hit the Flagpole when the timer is at 1, 3 or 6. Instead The Lost Levels method is used, where fireworks go off if the last digit on your timer matches the last digit of your coin total. If the number is odd, you get 3 fireworks, and if it's even you get 6. You can also receive a 1-Up bonus (also from SMB:TLL) if both digits of your coin total match the last digit of the timer when you hit the Flagpole. A number of minor changes were also made to existing stages that didn't appear in Super Mario Bros. or The Lost Levels. Items in many levels have been moved around or removed entirely. In The Lost Levels stages, Poison Mushrooms have been removed. In some stages, blocks and platforms have been moved around (including Fire Bars in the castle stages). The castle mazes (W4-4 and W7-4) require you to take different paths to clear them. Several of the Ground stages now take place at night. The fence posts in the background (mushrooms in Super Mario Bros. 2) have been replaced with microphones. The flag that pops out of the castle at the end of each stage, and the Axe behind Bowser, have been changed to the Fuji / NBS "Eye" logo. The Starman has been replaced with the "Hiranya" (hexagram), which at the time was a hot topic on the All Night Nippon radio show "Young Paradise". The Goomba has become "Okapi" and the Piranha Plant has become "Pakkun Okapi". It is believed that these characters are modelled after Japanese musician and All Night Nippon host Nakano Sunplaza. The Mushroom Retainers in each world have also been changed into hosts (see below). Nakashima Miyuki was the host of the All Night Nippon Monday show. Akira Takashi Ishibashi (Taka Aki) was co-host of the All Night Nippon Tuesday show with Nori Take. Take Ken Kinashi (Nori Take) was co-host of the All Night Nippon Tuesday show with Taka Aki. Koizumi Kyouko (KYON2) was host of the All Night Nippon Wednesday show. Beat Takeshi was host of the All Night Nippon Thursday show. Daisuke Matsuno (Ma-chan) was co-host of the All Night Nippon Saturday show. Nakayama Tadashi Hide (Hide-chan) was co-host of the All Night Nippon Saturday show. The unknown final character from Worlds A-C isn't a known All Night Nippon host. It's possible that it is Mario creator Shigeru Miyamoto. At the end of the game you rescue Peach in traditional Japanese dress. Following All Night Nippon Super Mario Bros., the Nintendo Sankei group was established. Aside from Fuji using Mario in its promotions, the group had one major notable output: the 1987 release Dream Factory: Dokidoki Panic, released to promote the Fuji TV Dream Factory Communication Carnival. 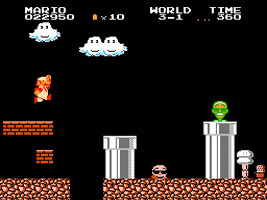 Dokidoki Panic was later retooled and became the U.S. Super Mario Bros. 2. 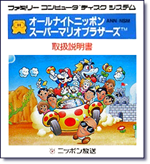 Due to only being released as a limited-run promotion, All Night Nippon Super Mario Bros. has become one of the rarest Famicom Disk System games in Japan, highly sought after by collectors.